I love to workout, and I really love to swim. 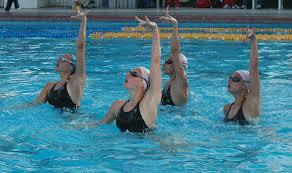 Which is great because nothing works all your major muscle groups better than swimming exercises in the pool. Why, you may ask? It’s because swimming works them all at the same time! Every swim can give you a full body workout. So, now comes a tricky question. What can you do if you want to focus on a muscle group, like the chest? Is there a way? Well, worry no longer, my friends. I can provide you with some moves that will work your chest and get some good training in at the same time. The first thing we need to do is isolate your chest and get rid of your legs! What you need is a pull buoy. 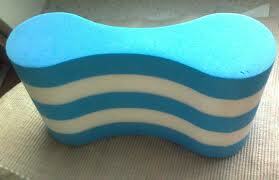 These figure eight looking foam pieces go between your legs or ankles and keep them afloat. This allows you to use just your arms and chest to pull you along without any sinking legs trailing behind. If isolating your arms and chest while swimming isn’t enough of a workout, then let’s crank-up the difficulty level by adding what’s called a drag. These devices come in different types and styles but they all work to give you resistance. As you workout with a drag, you will be amazed by the added resistance and intensity in your workout. 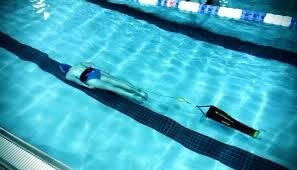 Pulling a drag and using a pull buoy will really let you feel the burn in your chest. That’s for sure! 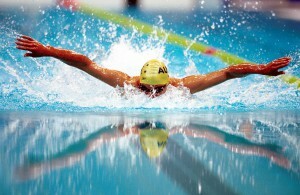 One of my favorite leg workouts when I’m swimming is treading water without my hands. Treading water with only your arms can be just as difficult. Let me tell you, using just your arms while treading will totally make your chest burn! You will definitely feel it the next morning. Just be sure to keep your shoulders out of the water. I mean if you’re going to do this, let’s make it challenging! Whatever you decide to do to build your chest while swimming, make sure that you change it up. Without variety, you will quickly plateau and stop getting the results you want. The best way to change it up is to start listening to music while you swim! Listening to music and making a workout playlist will help you customize your workout. It alerts you so you know when to switch to your next move or stroke. And it can help you monitor how fast you should swim at any given point. 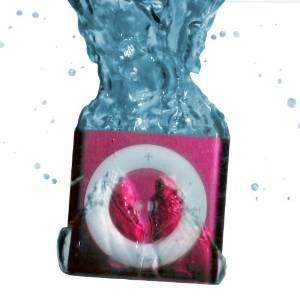 So, make sure that you visit Underwater Audio and pick up the best Waterproof iPod Shuffle out there. Load your music and start getting the results you’ve been looking for! If you have any comments, please leave them below, and until next time: swim fast and have fun!